Anne Lorne Gillies is one of the greatest champions of Gaelic culture, a singer who has given concerts across the world, a television personality, author, singing teacher, community arts worker, television and radio producer, academic, educationalist, language activist and above all, an enthusiast who delights in sharing her love for and knowledge of Gaelic song. Anne was born in Stirling on October 21st, 1944 and inherited her passion for the Gaelic language from her father’s side of the family and her musical aptitude from her mother, a cellist whose parents were both virtuoso violinists. In 1949 the family moved to a croft on the outskirts of Oban and it was here that Anne’s Gaelic education began, at school with the choir’s annual trips to the National Mòd and at home with the family’s Gaelic-speaking helpmeet, Mrs Catherine Lawrie from South Lochboisdale. While a pupil at Oban High School she began learning traditional Gaelic songs from the Rector of the school, John Maclean – brother of Sorley. On leaving school in 1962 she won the Mòd Gold Medal before matriculating at Edinburgh University where she studied for an M.A. and also learned many more Gaelic songs from her Celtic tutor, the Rev. William Matheson, a celebrated Gaelic scholar and tradition-bearer. She not only became a regular guest on Gaelic concerts, radio and television programmes, but also appeared regularly at folk clubs and festivals, often in partnership with traditional ballad singer Jimmy MacBeath. She went on to post-graduate studies at the School of Scottish Studies, had classical vocal training in Siena and London, completed an LRAM in 1966 and a Post-Graduate Certificate in Education at London University the following year: she then worked as a secondary teacher in Oxfordshire till 1971, when her television career took off. During the 1970s and 80s she appeared on network programmes for the BBC and ITV, hosting her own shows and introducing a wide range of legendary guests – including West Side Story star George Chakiris, Stephane Grappelli, Rolf Harris, Chic Murray, Fairport Convention, the Chieftains, and Clannad. Anne was also heavily involved in the movement to promote Gaelic language and culture – both as musician (she was Gaelic Singing Tutor at the University of Stirling’s pioneering Heritage of Scotland Summer Schools – where her talented students included Karen Matheson and Màiri MacInnes) and educationalist, helping to establish Gaelic-medium education in primary schools throughout Scotland. After a conversion course at Jordanhill College she became supply Gaelic-medium teacher for Strathclyde Regional Council, fitting this around a Masters degree course in Multi-cultural Education, a research project for Sabhal Mòr Ostaig (Popular Attitudes towards Gaelic Education) and the completion, in record time, of a Ph. D at Glasgow University (Gaelic-medium primary education in urban contexts). She went on to work as National Gaelic Education Officer for Comann na Gàidhlig, as writer/producer of programmes like Speaking Our Language and Caraidean for Scottish Television, and eventually as Gaelic Lecturer at the University of Strathclyde. 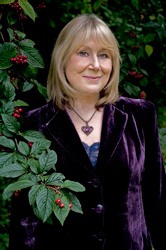 Among the most recent of her many published works and recordings are the CDs White Rose o’ June (the songs of Lady Nairne, 2003) and An Long Hirteach (the songs of St Kilda, 2004) and her book Songs of Gaelic Scotland, the definitive Gaelic song collection, which was published by Birlinn in 2005. She has an Honorary Doctorate from the University of Edinburgh, Honorary Fellowships from the University of the Highlands and Islands, the Royal Incorporation of Architects in Scotland, Rotary International, and the Institute of Scottish Literary Studies, and in 2010 the Scottish Government appointed her their Ambassador for Gaelic. But undoubtedly the greatest gift that has been conferred upon Anne Lorne Gillies is the gift of communication through the medium of Gaelic song.